The ill-fitting, bulky black pleather pants seemed suctioned to and definitely gripped to our German tour guide’s legs. Meanwhile, the yellow tinted John Lennon glasses he wore had migrated down his glistening nose. He unbuttoned his tweed jacket, revealing a black T-shirt that covered a bit of a paunch. 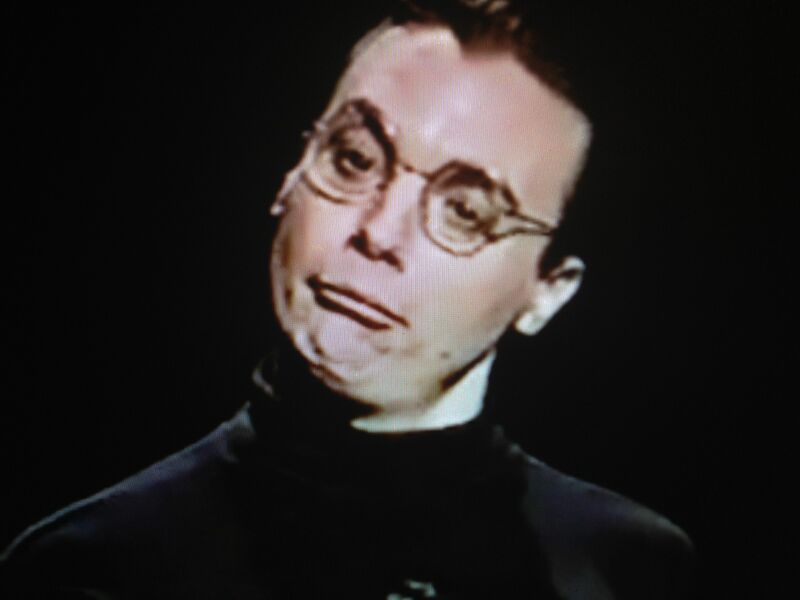 He looked like a portlier version of comedian Mike Myers’s Saturday Night Live character, “Dieter,” from “Sprockets,” the comedy sketch about an avant-garde German talk show host who suggests to guests: “Und now ve dance” with spasmodic, pseudo techno, pre-twerk moves. I was glad tour guide Dieter’s boss let him wear vinyl and black rather than some green and red lederhosen knickers nightmare. That, no doubt, would have completely crushed tour guide Dieter’s spirit. While it was not a good look, the fact that he unbuttoned his jacket was the only sign, however, that Dieter may have overheated. He wasn’t, for a moment, going to let anyone see him crack as the result of an unseasonably warm day in Cologne, Germany, and some non-breathable plastic threads. Kölner Dom, Cologne’s impressive Gothic cathedral. 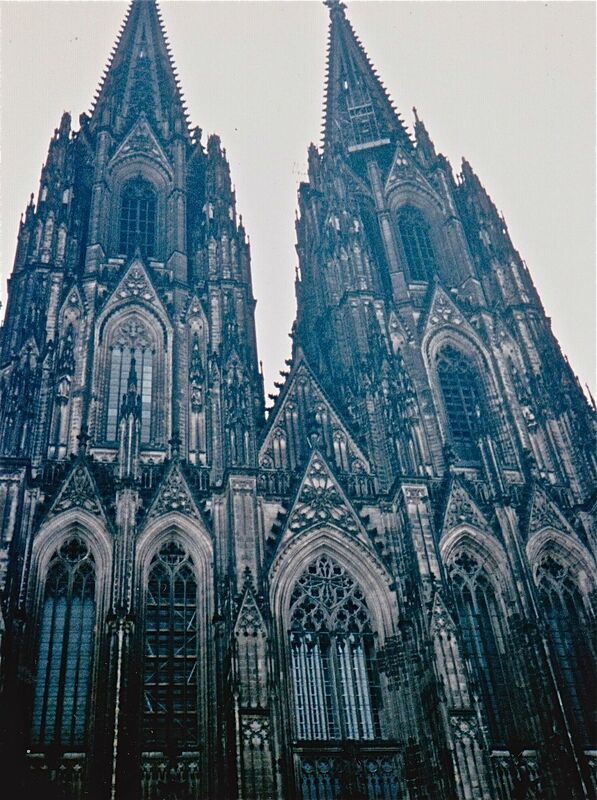 Without looking, he motioned toward the Kölner Dom, a UNSECO World Heritage Site and the largest Gothic cathedral in Northern Europe, as if it was nothing more than his parents’ basement. He then briefly mentioned something about the Cologne Cathedral being bombed 14 times, almost to the ground, by fighter planes in the early 1940s. He did not add that this was during World War II. 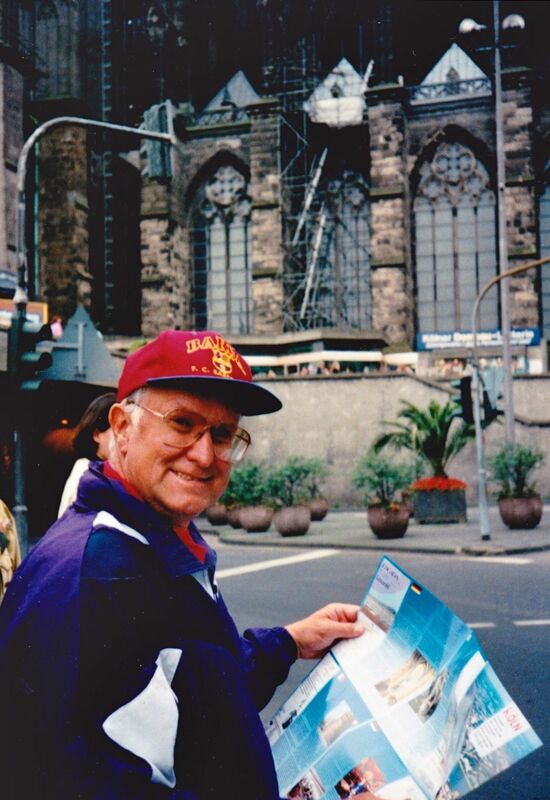 My dad, Ed, breaking out a tourist map. 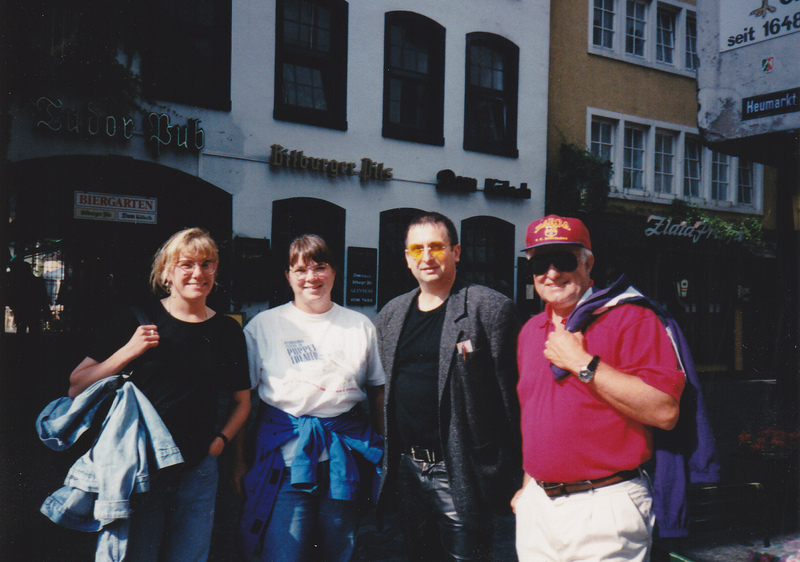 Regardless, my dad, Ed, and I were not going to let Dieter ruin our one-day trip to Germany. We had met up the day before in Maastrict, Holland. Both of us had business in the Netherlands. I was wrapping up a stint updating a chapter on the Netherlands for a budget travel guide, and my dad was speaking at a medical conference. 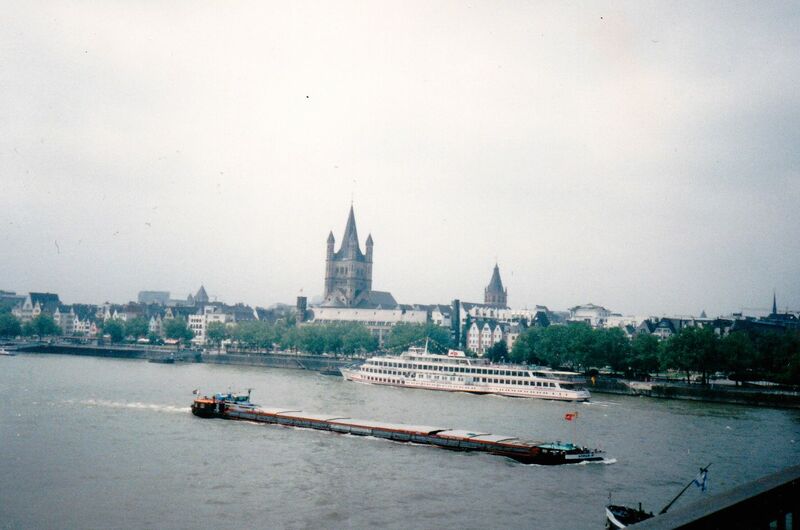 On a whim, we had decided to take a train from Maastrict to Cologne, which was about one hour and 15 minutes away. Signing up for a walking tour, we wanted to get a lay of the land. It was nice to just be a tourist. Plus, our chances of impressing Dieter were “nicht existent.” In fact, before beginning the walk, we even asked him where we could get huge pretzels. Two women had joined us on the tour. 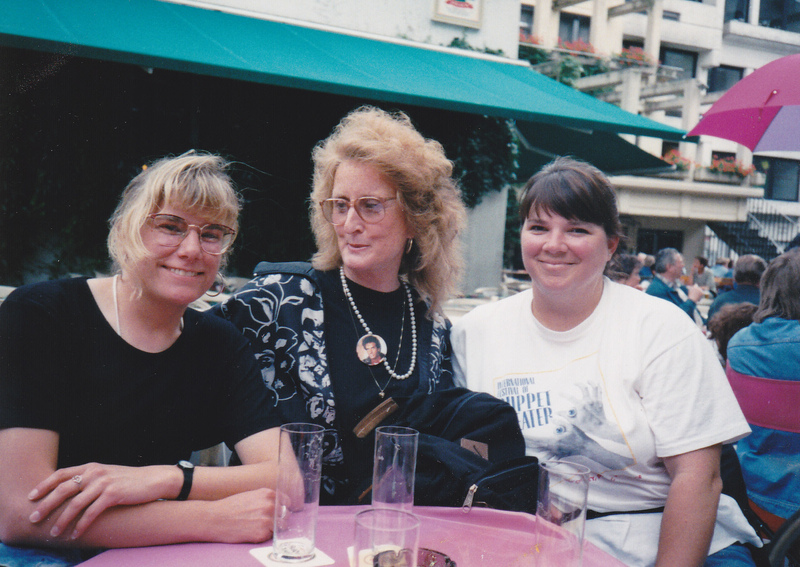 Carole was a middle aged American with poofy, slightly orangish hair and and Julie was a young Canadian. They were part of the David Copperfield tour that was in town. The magician was in Cologne, no doubt, to win over the same people who hurtled David Hasslehoff to the top of the music charts in Germany. Dieter surely shat his suctioned leather pants when he saw the Copperfield crew — especially Carole who sported a D.C. tour button, which, just like the soccer/football/hockey mom buttons, was the size of salad plate. There was no question that Carol loved her job and her boss. Cringe. I got it, Dieter. They were embarrassing, and ditching the tour became a lost cause since my dad and I comprised half of it. Staring at Dieter, we waited for him to dazzle us with facts about Cologne. He showed us the Rhine River and the impressive Hohenzollern Bridge with all the enthusiasm of a US Department of Motor Vehicles (DMV) employee who’d been verbally battered too many times by scores of pissed off people waiting in line. Meanwhile, Carole’s enthusiasm, not just for David Copperfield, but also for everything, caught on. Normally, I try to dial my wonder down while traveling in crowded spots for fear of being labeled an obnoxious American. Not Carole. And really, by no means was she rude or obnoxious. On her first trip overseas, she was just loving it. While talking a break from the walking tour, we sat down to have some Oranginas and enjoy the sunshine. With my new David Copperfield fan friends, Carole and Julie. “I’m so excited to visit both countries. What do you recommend seeing?” Carol asked, getting out a guidebook to mark it up. Julie didn’t say much, but that wasn’t surprising since it seems traveling Canadians often are content to let Americans talk on and on and reinforce our loud motormouth stereotype. I told Carole about a few must-sees, and she seemed grateful about the information. Realizing I had been quite judgmental about our new friends, and that, really, I was no different, I asked my dad to take a photo of me with Carole and Julie. Dieter, who had sequestered himself from the rest of the group, approached and beckoned us to move on. On a travel high, Carole began asking Dieter several questions in rapid fire succession about Cologne. Smiling and nodding several times, she encouraged Dieter’s monotone monologue. But his voice began to vary slightly as Carole listened to his every word. 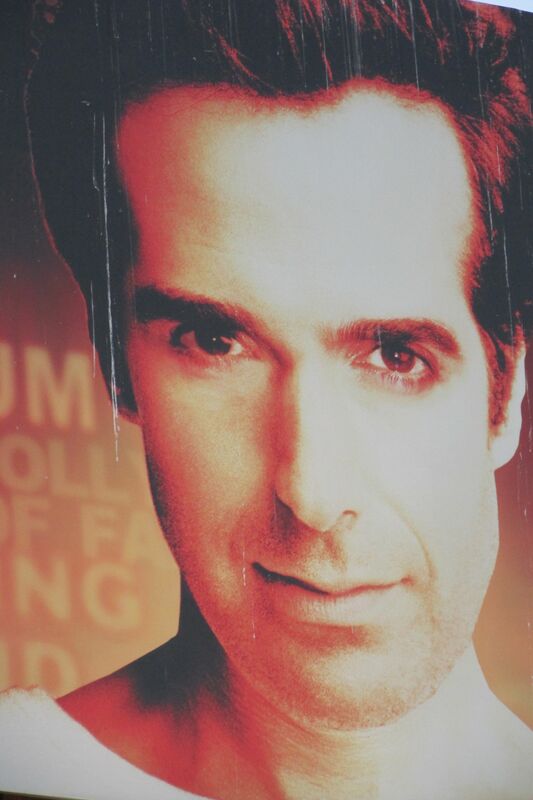 At first, I thought perhaps Dieter was secretly impressed with Carole’s connection to David Copperfield. After all, Germans have had a history of embracing cheesy American entertainment — Hasslehoff performed at the fall of the Berlin Wall for lord’s sake. However, it was more than that. Carole was just such a genuine person and so dang likable. And ultimately, she did what the rest of could not. At the end of the tour, Carole got Dieter to raise a corner of his mouth in a half smile for a group photo. Here we are with Deiter, our pleather clad tour guide. 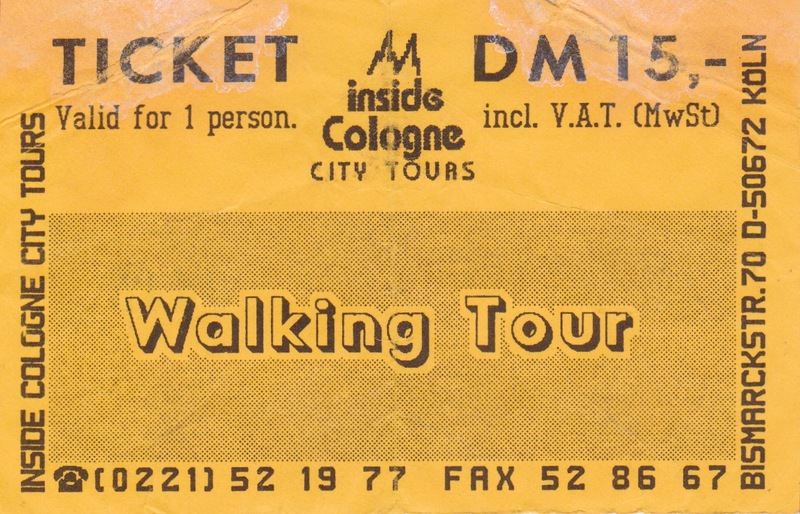 This entry was posted in Germany, Travel, Travel Humor, Travel Oops, Uncategorized and tagged Cologne, Mike Myers as Dieter, SNL's Sprockets, walking tours by stephglaser. Bookmark the permalink. Das was a good visit. Das beer was good. Das Weinershichel was good. Das bombs missed target, Das was good. Guten zeiten! Good times…good times even if we drove Dieter to the edge. I still fondly remember drinking Bitburger in the main square with you, Dad! May this month be a beautiful and adventurous one for you and your loved ones!